with a properly designed die. Our knowledgeable design staff has a vast diversity of tooling experience that has earned the respect, and repeat orders, from customers across the country. That, combined with our long history as quality production metal stampers, insures that you will get tooling that lasts longer, is more productive and is easily maintained. We can design from a customer supplied sketch, print or a supplied part. Our Design Department works in a number of platforms including ME-10, CADKEY and AutoCad. Tooling can be created using a variety of cartridge and insert technology to produce family tools capable of producing unlimited numbers of parts, which share common features. We can design tooling to meet your every need. 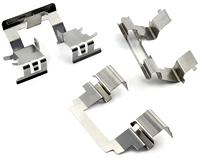 From a simple blank to complex tooling that may require in-die tapping, assembly in the tool, or multiple strip tooling. Our goal is to eliminate costly secondary operations and to maximize your profits.